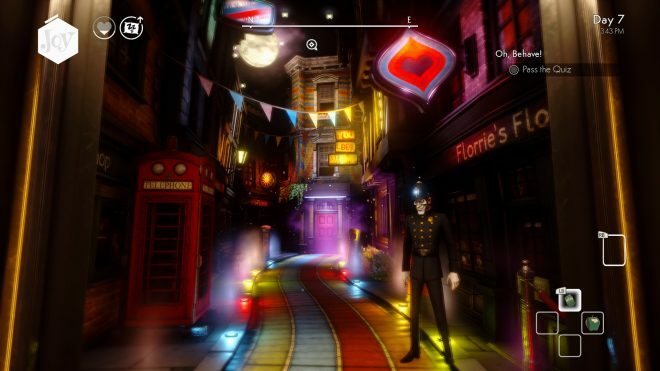 We Happy Few Review: Joy or Downer? Happiness. People want the key to it; they base love on it, and they say that money can’t buy it. Imagine if it were as easy as taking a pill to experience that emotion, no matter what you were previously feeling. Can everyone with the same emotions make for a good society? How long could one possibly stay sane with a chemical that induces joy? What happens if you stop taking the pill after being on it so long? Won’t some people have allergies or bad reactions? 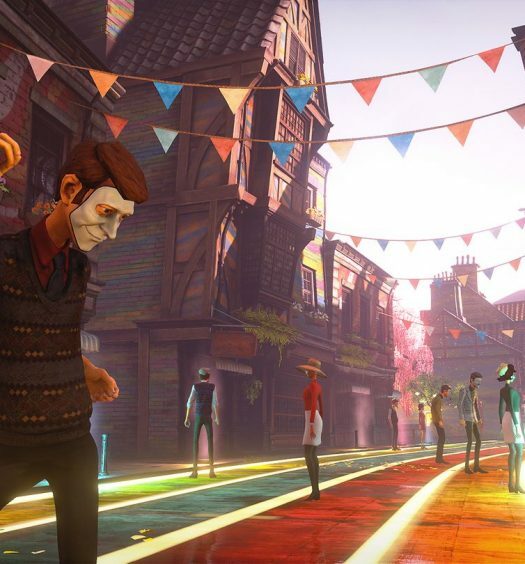 We Happy Few bases its eccentric world on these questions. We Happy Few is set in a dystopian society, with an alternate reality in which the United Kingdom was lost to Germany. It combines many genres but is mostly compared to the games Bioshock and Fallout. 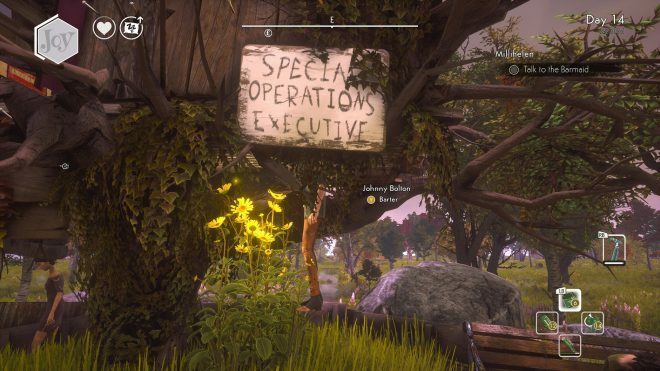 In fact, because of those comparisons while the game was only in early preview stages, developers Compulsion Games catered specifically to what the players wanted: a story-driven narrative. While surviving the paranoia-filled society, you will craft, upgrade skills and ultimately decide the fates of both civilians and the government officials that you encounter. There are three story acts, each with different characters and intertwining storylines. 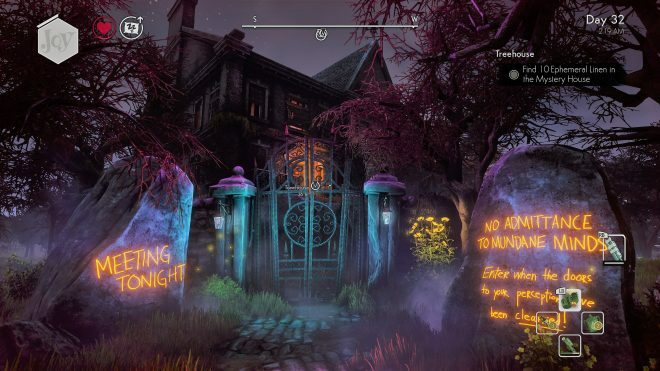 Atmospheric Experience – A unique twist on the 1960’s, We Happy Few presses the player against a wall of moral choices. There is a drug called Joy that everyone is expected to be taking. You live in a state of caution, as the world around you is paranoid and homicidal if you aren’t taking the same pills. It’s your choice to kill them or stop them in a non-lethal manner. To fit in, you must sometimes take the drug yourself in order to avoid the suspicion that you’re a downer. The citizens don’t like when you appear aberrant. While on Joy, you experience a pure and happy environment with rainbows and butterflies. You even walk with a gleeful strut. While off it, the world is bland. Addiction is a complicated subject, and We Happy Few projects on to you the decision of how to handle it. Do these citizens deserve to die? Was it their own choice to take the drug? Or are they just victims and can’t help it? With a fascinating contrast between a bad reality and a pleasant fictional life, there is complete satisfaction knowing that game is unique to anything else you have played. Rumaging – One of the highlights is the fact you can find so many different items to use and craft. Going into someone’s home, murdering them, and then taking the belongings you desire is pure fun. The main goal of the game, of course, is to escape the island. But on this journey, you will be doing quests and upgrading your character so that you’re prepared for the final leg of the adventure. A big part of this is crafting better weapons and gaining plenty of health items. While you can stealth through a decent amount, you’ll soon become confident enough to handle most situations as you increase your combat prowess. You get the choice how to handle most situations, be that stealth or throwing bombs into groups of enemies. It seems homicide is actually the most rewarding, and you really have no negative repercussions. A wanted system could have added to the excitement of doing bad things, or maybe some morality meter. The only reward for avoiding bloodshed is an achievement for not killing anyone (directly) in the entire playthrough. It’s just too tempting to go wallop someone with an axe from behind to loot them and continue on happily, even without being on Joy! Hours of Joy – The entire first Act feels like it could have been its own campaign without any additional content. Hours of quests, item management, and discovery will keep players from quickly speeding through it. If you’re playing on the hard difficulty setting, you will have to be diligent with collecting items and crafting to survive. This adds even more importance to searching everywhere for items that will help you succeed. There are two more acts on top of it, which was a pleasant surprise. 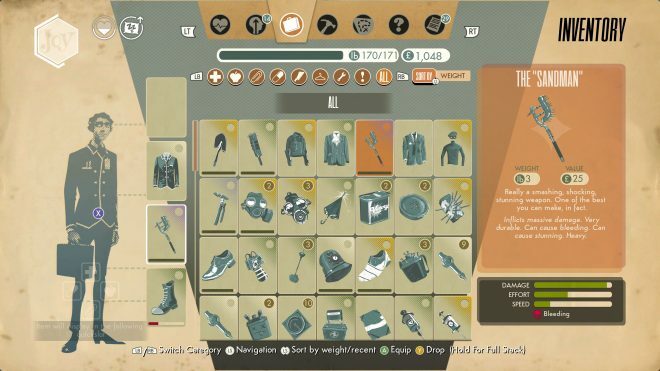 Happy Inventory – Seemingly useless items will find a purpose, and your inventory will get full as you hoard everything in the hopes it can be utilized in crafting. You can unload your mostly stolen goods into your bank of items at save points. No weight limit in your bank encourages you to “take all” when you are investigating. Don’t think you’ll ever use an item? You can sell it at a store and buy what you need instead. Sometimes you will find rare books to read that give you perks, and once collected gives you a permanent boost to various mechanics. Once you are told you are at the end and there’s no turning back (the end of an act), you’ll realize some of that junk was indeed useless, but at the same time, you aren’t disappointed with your collecting obsession. Dark Humor – Although there are stressful situations and an abundance of manic scenarios, you can laugh at the absurdity. The voice acting is phenomenal, and the dialogue is quotable. If you usually skip scenes, you may find yourself enthralled to see what is said next. The quests can be clever and entice you to want to complete them all while rewarding you for doing so. Combining quirkiness with a dark theme works like a garden of flourishing flowers. It’s everywhere and quite satisfying. Bugs are a real downer – There are a landmine of glitches and graphical tears that make an otherwise outstanding game seem unready to have been sold to the public. It can be frustrating to have enemies teleport behind you, or for objectives to seemingly vanish as you attempt to complete them. I’ve had an NPC that gives a quest appear in a house she wasn’t supposed to be in (she was on the street earlier), blocking a door I wished to enter. While not completely game-breaking, it does raise the suspicion that this game was rushed to be completed for the release date. Patches will likely fix many problematic bugs, but at its current state, it’s fairly unstable at times. Wait, no waiting? – There’s a curfew at night, and all of the civilians go inside while in town. A few quests involve needing to come back at a different time of day, or days later. The only way to pass the time is to sleep, and that’s not always convenient. While other games have included an ability to simply wait, here we have to sleep or wait ‘manually’ by letting the time pass which can be quite a while. You’ll find yourself wishing there was an option to let time pass without the benefits of sleeping, but we do not get that luxury. Marathon Simulator – Fast Travel doesn’t have enough points in place to make for breezy travel. You find yourself running through fields or towns that don’t have much of note, which creates for some boring jogs. With too many dead ends and few points of interest, you’ll feel the weight of a heavy burden which has become point A to point B. There are some points you should be able to fast travel to (people’s homes you can rob or cellars). It appears a lot of the land is just leftover space meant to coincide with survival, but since that was changed, it only adds fury to the impatient gamer. After many alterations and years of development, it is no surprise that things are a bit messy. However, this is an outstanding mess to play in. It makes use of inspirations and delivers a sophisticated yet humorous adventure. While far from perfect, the package delivered is one you’ll love opening and exploring. You can play for hours on end and still have an addiction to open every drawer or checking every waste basket for precious supplies. While there are design choices that don’t make much sense, you can look past them and enjoy it for what it is: a playground for madness. We Happy Few will be a joy to most who decide to take the pill. Anyone who doesn’t like it is a real downer. Lovely day for it! 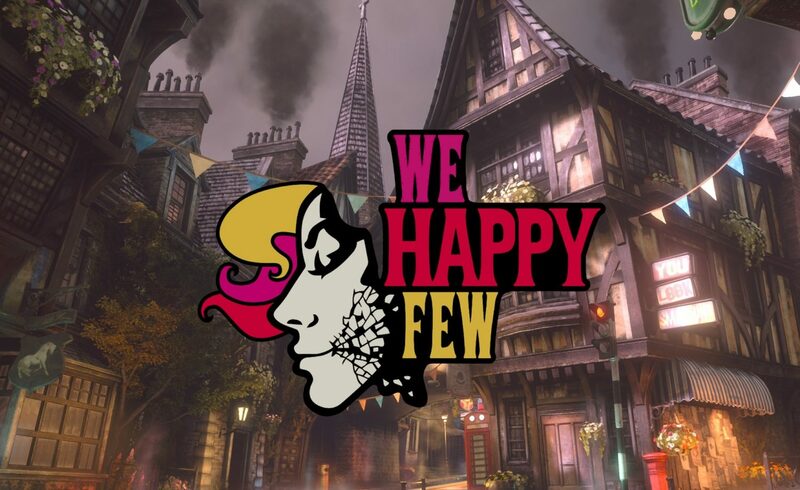 We Happy Few was developed by Compulsion Games Inc and published by Gearbox Publishing on Xbox One. It was released on August 10, 2018, for $59.99. A copy was provided by the publisher for review purposes.